The system features an 8th Gen Coffee Lake 2.2 GHz Intel Core i7 six-core processor, 32GB of 2400 MHz DDR4 onboard memory, a 512GB PCIe-based SSD, four Thunderbolt 3 (USB Type-C) ports, a Force Touch trackpad, a keyboard with a 3rd-gen butterfly mechanism, stereo speakers with double the dynamic range of its predecessor as well as improved bass, 802.11ac Wi-Fi, Bluetooth 5.0 wireless technology, and even a 3.5mm headphone jack. Box Dimensions (LxWxH) 16.0 x 11.5 x 3.5"
15.4" MacBook Pro with Touch Bar (Mid 2018, Silver) is rated 4.5 out of 5 by 241. Rated 3 out of 5 by Timothy from Functional improvements they are not.... I do not like the new "butterfly" keys -- I appreciate a more substantial resistance to my keystrokes. I find the touch pad overly sensitive -- sometimes i swear it's registering the heat or the EMF radiating from my fingertips, rather than the actual pressure of my fingertip, such that, for example, I am frequently inadvertently right-clicking while hovering over the touchpad. Don't even me started on the USB-C ports only. Why I should have to fork out another $50 to hook up my $1000 Apple Thunderbolt display to a new MacBook Pro is infuriating, to say nothing of having to carry around a handful of converters so Jon Ivey can pride himself on minimalism is beyond me. I like the screen a lot and I suppose the Touch Bar will prove it's worth in time. Rated 5 out of 5 by Ryan from Upgrade from Mid-2012 The new 2018 MBP is amazingly fast, sleek and ultra light. I bought a usb-c hub that has ports to connect my usb external hard drive, usb printer and an HDMI port for an external monitor so no problems connecting old devices to this new MBP. The touchbar is great as it adapts to whatever program I am running. The keyboard is a massive improvement from the Mid-2012 version i previously had. The touch pad is unnecessarily huge and jumps a bit so i had to play around with the track settings before getting it right. No real problems there either. Very pleased with it overall. Rated 1 out of 5 by Pj from Very Poor Design! First of all they changed from having a magnetized power connection to a small, hard to plugin connection. Magnetized was much easier to plug in and out, and if youre a klutz like me and trip over your power cord it would unplug without taking the computer with it! Also theirs 10 of area along the side of the keyboard for plug in ports, including power. Apple has chosen to put the ports within a fraction of a centimeter next to each out. You need tweezers to surgically remove items to plugged in or out. Really? You couldnt design a port connection just slightly further apart? And finally, Im not doing back flips over the speed. For the price I think you can find better! Rated 4 out of 5 by Dr Anna from 15 inch, i7 2.6GB, 16 GB Ram, 560X graphics, 512 GB Storage. I previously used a 2014 MacBook Pro (i7 2.2 GHz, 16 GB RAM, 256 GB Storage) and compared to that, I noticed the following: 1. Keyboard is noiser and though the travel is less it is not bad. 2. The performance for everyday use appear almost similar but I movie use feels faster. 3. Miss the MagSafe charging option with LED indicators. 4. Nice to be able to charge from any USB C ports from either sides. 5. Screen quality is the same with same brightness levels. 6. Tru Tone option is nice. 7. Touch Pad is useful at times like with Google Maps though for usual adjustments the previous option is preferable. 8. Screen unlock with Touch ID failed once and hope this is not a recurrent issue. Rated 5 out of 5 by bruce from So far So good I brought this computer as a UI designer. I also have a 2015 Macbookpro in use so I can clearly find the difference between them. Pros: - Thinner than 2015' Macbookpro, looks better. - The keyboard is better than 2017/16 but still can't compare to 15' - Better CPU, GPU...and everything you may not find the difference. Cons: - Once you get this MacBook Pro, you will need to buy a bunch of accessories like USB-C adaptors, mouse... and you can really throw your old mouses away. -Tracking Pad is larger but not easy to use compared to my old one. I am not going to use a large tracking pad to cook eggs. - I am still getting used to the "Truetone" screen, which is a good technology for some users but not for me. I still prefer my old MacBook's screen. Rated 3 out of 5 by Jonathan from keyboard issues, battery issues I got a great macbook pro, specd higher than I thought Icould afford because of greatbh photodeals. The battery runsout after lessthan 3 hoursoflight use. Andim leavving alllthetypos in to illustrate the issues with the keyboard. Thespace keyrarelyworksthe first time.At first i thought. i mustbetouching thetrackpad but I am. now being very careful. The space bar requires an extremely heavy touch to work. Often requiring one to slow down, backup and rehit the space bar. After I finish writing this review Im going to see if I am still within the return window. Rated 1 out of 5 by Ming from Not working I got the computer and it doesn't work. Apple should improve their quality control. Apple store won't exchange for me although they can repair it. Have to contact B&H to exchange. Hopefully it will work. Rated 5 out of 5 by Mingding from Amazing machine This is just an incredible laptop. Switching from my old 2013 retina MacBook Pro, I can safely say that this one is a big improvement on every aspect. Screen is brighter with more colors, RAM is faster, SSD and graphics are a LOT faster, CPU is almost twice as fast, and being able to unlock the laptop with my Apple Watch or my fingerprint is just unbelievably convenient. I can finally set up a strong and long password for my laptop. And the design is stunning. It's super thin and light and sturdy and dense. It's just very well crafted. I'm also finding the Touch Bar quite useful. Overall, I absolutely love this laptop, and it's pretty amazing that B&H has such a good deal on a laptop that was just released a month ago. Can you tell me the model of this macbook? Can I add applecare after the sale? You would have 30 days to add it on, but only at Apple. At B&amp;H we only offer i at the time of the order. I have an LG UltraWide monitor and it&rsquo;s paired with my MBP via USB-C, it&rsquo;s keep charging my MBP even when it&rsquo;s fully charged. Is it ok or it will damage the battery on long-term? The MacBook Pro will not allow the battery to overcharge. Purchases in our store are subject to an 8.875% local sales tax. This tax is not a VAT, and cannot be recovered by non-USA visitors when returning home. Does this come brand new and with 1 year of Apple Care? Yes, this is new in a box and comes with 1 year Apple warranty (90 day phone support). 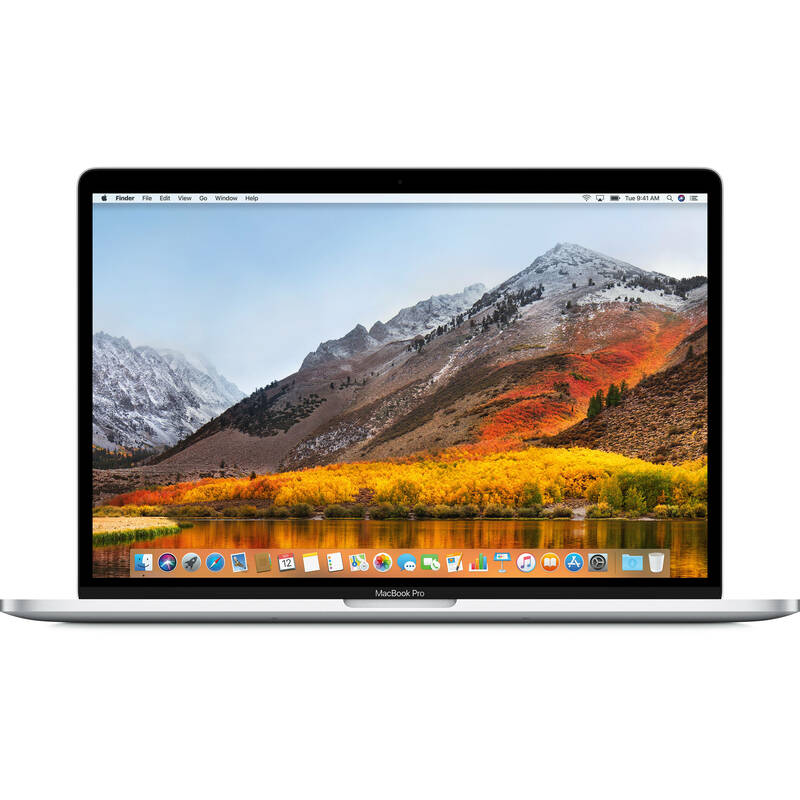 The AppleCare 3 year coverage plan can be added on when you add the item to your shopping cart. .
what is the battery time on apple mac book 15.4 mid 2018? i would say, bout 6-8 hours, if goin to use for work, like video editing , it will last like 2 hours or less. When will the 15.4 MacBook Pro be ready for shipment with 2.2/4.1 , 16GB RAM , 512GB SSD after Pre-Order?